Welcome to the Kirstenhof Primary School website. Besides general information, the purpose of this site is to give our visitors an insight into who we are and what life is like for a Kirstenhof child. The most important characteristic of KPS is that it is a community school. The vast majority of our families come from the immediate surrounds. The school supports, reflects and leads the people in the constituency that we serve, meeting the educational needs of the community and exposing our children to new ideas and elevated standards. The suburb of Kirstenhof is a family-orientated community where children and family activities are prioritised. These families have a strong sense of values and support for those in the community. While producing top academic results with a strong cultural and sporting tradition, KPS is a school that prioritises social and emotional development. This translates into a school environment that is well disciplined, happy and a place where everyone is accepted for who they are and are allowed to express themselves. The school’s motto is ‘ever green, ever growing’, which challenges each child to participate in our rich and diverse programme. It also dares the school’s leaders to keep the school current and relevant to children who are learning to excel in a fast-changing world. While KPS children are encouraged to make use of every opportunity for an excellent education, this can only happen in the context of a supportive and encouraging family. Parents, grandparents and other members of the family are seen as essential in the educational process. For this reason they are included wherever possible in school activities and are welcomed as a part of the school. 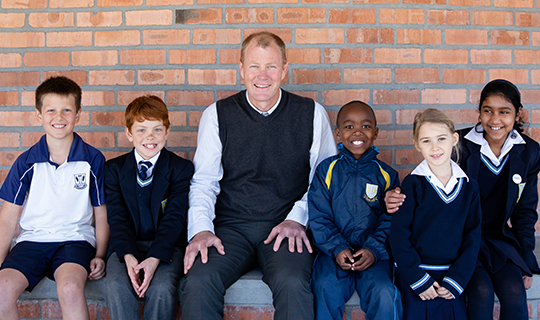 KPS school leavers continue their education at many of the top high schools in the Southern Suburbs where we are blessed with a wide variety of excellent high schools. With this in mind, KPS goes to great lengths to ensure that our children are prepared to excel in this competitive environment.